SCOTTSDALE, Ariz., July 28, 2015 ­ Global Mobility Solutions (https://gmsmobility.com), a leader and innovator in the relocation and talent mobility space, has launched a proprietary, cloud-based MyRelocation technology solution for clients and their relocating employees. MyRelocation technology provides industry-leading tools and services along with advanced 24×7 information access from any device. These solutions support and empower corporate relocation programs across the globe. The MyRelocation login shown on multiple devices, the cloud technology features a modern responsive design. MyRelocation technology has been designed from the ground up with feedback from hundreds of human resource professionals and their transferring employees. A convenient transferee dashboard unlocks a wealth of information and functionality, from downloadable relocation guides to interactive Google Maps™ pre-programmed with origin and destination data. Relocating employees can view and track initiated services, submit expenses and connect with their relocation coach all with a few clicks. MyRelocation works with any connected device on any platform, with a responsive design that makes for unmatched ease of use on desktop, mobile or tablet devices. This approach to simplicity is immediately apparent upon logging in to the customizable management dashboard. Initiating new employee relocations can be managed and activated on a single screen. 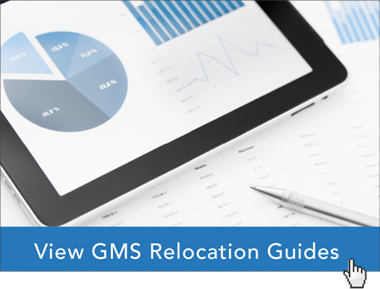 According to GMS executives, MyRelocation also features over 200 customizable reports available on demand. Additionally, MyRelocation features an extensive “Relocation Knowledge Base” drawing upon decades of industry expertise and research. A selection of white papers, blog articles, and other valuable information helps both relocating employees and their employers. Founded in 1987, Global Mobility Solutions is a global corporate relocation services company that specializes in workforce mobility. The company’s corporate relocation services include global assignment management, domestic relocation management and a range of pre-decision solutions. Global Mobility Solutions is a back-to-back winner of HRO Today’s 2014 and 2015 customer satisfaction survey, and rated #1 in the relocation services industry for breadth of services.